Pub beer prices in Norway, Denmark, Sweden and the UK. 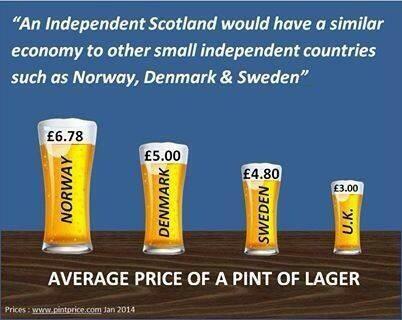 Better Together have been circulating an illustration of beer prices on Twitter today. It seems to be based on figures from Pintprice.com, which is hardly a reliable source for such information — it’s simply a site for people to record what they’ve paid for a pint somewhere in the world. The result is that the Danish price is an average of prices as diverse as the following: Aalborg: £1.04, Aarhus: £3.44, Copenhagen: £5.08, Kastrup: £7.22, Odense: £2 and Sønderborg: £6.69. One should therefore take the figures they used with a grain of salt. I don’t dispute at all, however, that a pint in a pub in Denmark tends to be more expensive than what you’d pay in a similar place in Scotland. For many people in Denmark, a pub is a place you go for a drink after your cinema trip, not your regular watering hole. So most Danes buy a lot of the beer they drink in supermarkets, not in pubs, and prices aren’t shocking in shops. A typical price for a 500ml can of Carlsberg (which is of course not by any means the cheapest brand) in a supermarket seems to be around 15 Danish crowns (= £1.65). Beer prices are much higher in Sweden and especially Norway than in Denmark, but that’s because of a deliberate price policy in order to combat alcohol-related problems, so trying to estimate the general cost of living by looking at pub prices is a very bad idea. Apart from that, GDP per capita is much higher in the Scandinavian countries than in the UK (Norway $100,318, Denmark $59,190, Sweden $57,909 and UK $39,567), so even if Scandinavians want to spend their salary drinking lager in pubs, they tend to be able to afford this. The whole point of the Yes campaign in general and of the Common Weal project in particular is that we need to move away from the current low-wage economy and try to achieve a situation like in Scandinavia where prices might a bit higher but salaries are much higher so that a typical person can afford a better quality of living. In other words, perhaps putting up the minimum wage to a reasonable level will mean that pub prices will rise a bit, but if most people are much better off than before then it’s not a problem at all. Besides, increasing the minimum wage and/or increasing alcohol taxation will be policy choices for an independent Scotland. If we want cheaper pints after independence, we can simply vote for political parties who want to achieve this. It will be up to us.